Tomorrow is the first day of the Uncaged Toy Piano Festival, organized and curated by Phyllis Chen. I don’t know how I can share a stage with heroes of toy piano like Phyllis and Margaret Leng Tan, but I’ll be doing a few pieces with toy player pianos that I developed at the Queens Museum Sound Art Residency this summer. I’ll also be bringing my robot toy piano to perform Satie’s “Vexations“, and demoing the Resistor JelTone, a working toy piano made of Jello. The festival runs tomorrow (Tuesday 11/29), Thursday (12/1) and Saturday (12/3) at three different venues in Manhattan, and you can get all the details at uncagedtoypiano.org. In a week or so I’ll be going back to New Orleans to see a performance at the sound sculpture shantytown I worked on in September. The New Orleans Airlift brought a bunch of artists to build a little village of musical instruments out of the wreckage of an 18th century house, and invited local musicians to perform with/on/in them! There’s a teaser video from the first performance — you can hear & see my piece, a set of amplified squeaky floorboards, providing the bass line starting at about 1:22. The project was covered in the New York Times last week, and you can read all about it at dithyrambalina.com. Next week will be my first chance to hear and see the completed shantytown! In October I set up a show of my greenmarket scanography images at the Brooklyn Public Library’s Central Library at Grand Army Plaza, along with two amazing photographers in the (Un)Still Life exhibit. There’s just one week left before the show comes down after this weekend, so please visit if you’re in Brooklyn. I had some of my images printed huge for the first time – more than 5 feet tall for one of them! And I had fun putting together a grid of almost 200 little tiny prints – check out the installation timelapse. By the way, all the prints are for sale, and a portion goes to benefit the library. …and then I went to Europe, to talk about my work at VU Amsterdam’s lecture series with the Metamatic Research Initiative, and to show a piece I made for Artbots in Gent, Belgium. I haven’t really had time to collect my thoughts – or my photos – since I got back, but you can see a recording of my talk at metamaticresearch.info, and I have a silly video demonstrating the Voice Extruder, an installation which translates visitors’ voices into little sculptures, which are immediately fabricated for the visitor to take home. The Voice Extruder is an offshoot of my work for Metamatic, about which I’ll have much more to say soon! The day after I got back from Europe, I took the Voice Extruder to Baltimore for the Exploratorium’s Tinkerers’ Ball. And what are you up to? Keep in touch! 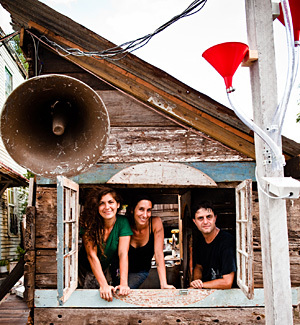 * shantytown photo by Mellissa Strkyer — see lots more photos from the New Orleans project at the dithyrambalina blog.